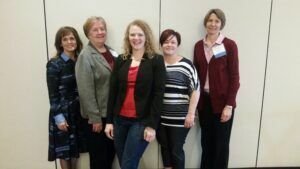 On April 24 and 25, the Minnesota Section of the Association of Women’s Health, Obstetric and Neonatal Nurses gathered for their annual conference. The Diaper Bank of Minnesota was honored to have been chosen as a partner for this conference, and the nurses held a diaper drive in conjunction with the event. Talk about people who have a passion for helping babies! 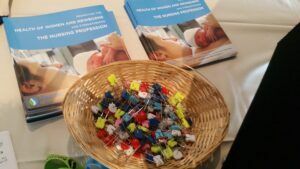 We were thrilled to arrive and find that the organizers had purchased adorable “diaper pins” to give to each nurse who donated to the drive. 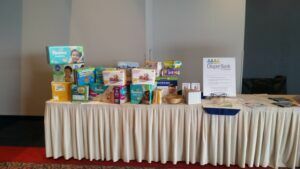 Over the two day drive, the AWHONN conference collected 1,441 diapers and $344! In total, that’s like donating nearly 3,500 diapers! So many diapers and such a nice display! Diaper Bank board member Christi Krautbauer with members of the AWHONN volunteers who organized this diaper drive. Thank you to Sue Gehlsen and all of the other volunteers who made this diaper drive a success. We are very grateful for your partnership and generosity!